The inaugural European Championships multi-sport event hits Glasgow this month – and alongside the action in aquatics, cycling, golf, gymnastics, rowing and triathlon, six young reporters will be sharing an LGBT-inclusive message of ‘Sport for All’ through the power of mobile journalism. It’s all part of a National Lottery-funded project titled ‘Mojo on the Green’, which is being co-ordinated by the charity LEAP Sports Scotland (LEAP stands for Leadership, Equality and Active Participation), with training provided by social enterprise Media Co-op. From Thursday, August 2, to Sunday, August 12, the journalists – all aged between 18 and 25 – will be undertaking a variety of media tasks. Claire Dean, of Media Co-op, explained: “Mojo on the Green is all about giving young LGBT+ people a voice. 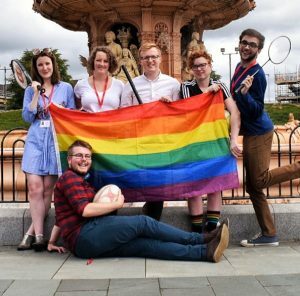 Part of the project will see the reporters filming people as they support the Football v Homophobia campaign by taking part in a giant inflatable human table football game in the Activation Zone on Glasgow Green. They’ll also be interviewing athletes, officials and volunteers and covering a range of events at Pride House in their bid to promote a message of equality and inclusion. A social media strategy using the hashtag #LGBTchampions18 has been developed by the six reporters with the aim of raising awareness around discrimination and mental health. Among the group are Fraser Knight, a 21-year-old final-year journalism student, and 22-year-old Jo Reid, who recently graduated from Glasgow University. Knight said: “Throughout my life, I’ve not felt confident enough to take part in sports, because there is a fear attached to this as an LGBT+ person. For Reid, the project represents an opportunity to shine a light on various challenges faced by those who are LGBT. “It’s really nice that young people are being given the responsibility and agency to promote and talk about issues that are important to us, especially during such a high-profile event,” said Reid. LEAP Sports are also leading on Pride House, a converted unit on Glasgow’s Trongate focusing on LGBTI equality in sport during the European Championships by way of a series of over 70 sport and cultural events.